Stock photo of wooden gate at Hessenpark (Open Air Museum), Neu-Anspach, Hessen, Germany, Europe. Wooden gate at Hessenpark, the Open Air Museum in Neu-Anspach, Hessen, Germany. This stock photo shows a weathered wooden gate at Hessenpark (Open Air Museum), Neu-Anspach, Hessen, Germany, Europe. Planks of wood make up this wooden gate at the Hessenpark (Open Air Museum) in Neu-Anspach. Five wide planks of wood are mounted side by side together. Two planks are attached horizontally to the gate with a third plank sits diagonally between the two horizontal planks. 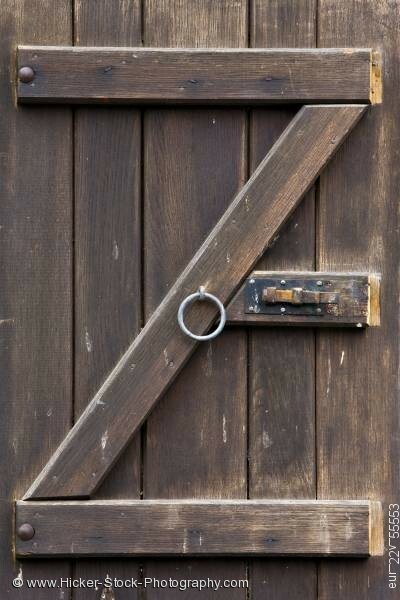 Two large metal bolts secure the horizontal wood to the wooden gate. A round metal ring is attached in the middle of the diagonal plank. Just to the right of the metal ring is another piece of wood with metal attached to it. The wood has a dark stain on it but is slowly been worn off in some places. Weathering and bird droppings has aged the wood and the metal. Wooden gate at Hessenpark (Open Air Museum), Neu-Anspach, Hessen, Germany, Europe.